Having a newcomer child in your care presents unique challenges. It’s also an exciting opportunity to learn, to grow and to have a lasting impact on a child’s life. Whether they’re experiencing culture shock, learning a new language or simply adjusting to the many changes in their lives, these children are often at their most vulnerable. As a caregiver you are in an ideal position to help ease this difficult transition by creating a warm, welcoming environment that supports the needs of newcomer children—but it can sometimes be difficult to know where to begin. How can you create an environment that fosters relationships and provides a safe and nurturing experience for newcomer children? How can you communicate with children and their families when you don’t share a common language? How can you ease a child’s transition into a child care setting and remain sensitive to the many challenges that they and their family may be facing as they adjust to life in Canada? 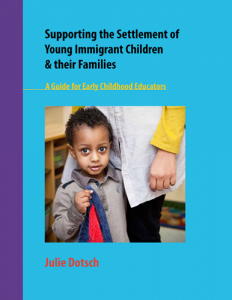 Written by child care and diversity expert Julie Dotsch, with strategies and ideas from caregivers working in the field of newcomer child care, Supporting the Settlement of Young Immigrant Children & their Families builds on caregivers’ professionalism, knowledge and experience to provide a greater understanding of the new immigrant and refugee experience from a child’s and family’s perspective. This book is suitable for anyone working with recent immigrant and refugee children It provides practical approaches and examples to enhance your program, help newcomer children thrive, and build relationships with families. If you are interested in purchasing a copy, please contact us.